After Salvatore started work for the University in its School of Computing and IT (SCIT) on 1st September 2004, I was on the University campus on that and almost every subsequent day on which Salvatore attended work. We discussed the difficulties he encountered at work regularly and I accompanied Salvatore to various meetings with the University. When Salvatore was appointed to work for the University, I was very pleased because the advert had said they were looking for somebody with an academic focus in Human Computer Interaction and this was his area of research. Salvatore applied because they were requesting HCI expertise and his qualifications exceeded the requirements of the post. Salvatore was in good health and enthusiastic when he started work for the University. From September 2004 onwards Salvatore confided to me of various incidents I would describe as bullying. I started to notice Salvatore was tired and irritable after work quite early on in his employment. He would usually work until quite late at night and on the weekends on his research, his postgraduate studies and on developing ideas for improving the curriculum, in addition to preparing his teaching. He was enjoying his research and only became stressed as a result of the actions of the University. He was clearly keen to try to make the job work out. From about October or November 2004 until Salvatore had to stop work due to ill health in October 2006, I heard recordings of several meetings between Salvatore and the University. I heard these because, after Salvatore made clear to me that he was feeling bullied within the University’s School of Computing and IT, I asked to hear the recordings he took of his meetings. I understood that he did so to assist in remembering what had been said and provide a possibility to reflect on the meetings afterwards (instead of taking notes). These tape recordings subsequently became helpful because I could hear them and understand what was happening at his work and try to help by discussing the problems. The first recordings I heard were of two meetings in October or November 2004 between Salvatore and his line manager, Peter Musgrove. Salvatore raised a grievance about the behaviour of Alison Bunce. Peter Musgrove told Salvatore that he was not going to do anything about the incident with Alison Bunce and that “Alison has problems which are nothing to do with you” or words to that effect. He instructed Salvatore to “forget about it”. They also discussed Salvatore’s staff development funding for research and that Salvatore was paying his own PhD fees. Peter Musgrove said there was about £2000 a year available for Salvatore. When Salvatore attempted to discuss his ideas for curriculum development, Peter Musgrove indicated that it did not interest him and Salvatore should talk to Helen Ashdown. I heard a series of recordings of ‘probation meetings’, which took place between December 2004 and July 2005, between Salvatore and Helen Ashdown. I clearly recall from these meetings that Salvatore raised complaints about the unprofessional conduct of colleagues he had experienced during the initial months of his employment, breaches of procedures including his probation by the University and failures by the University to address his complaints. He put forward many ideas for curriculum development but was persistently told he could not participate in curriculum development at that time. I heard Helen Ashdown make intimidating comments during the meetings including ‘nobody likes to work with you’ and threatening that there were not likely to be enough hours to timetable Salvatore to. At no time did I see or hear anything to suggest that the grievances Salvatore had raised had been investigated or resolved. In the meetings I heard, Salvatore was consistently and without investigation, blamed by Helen Ashdown for every complaint he raised. In early 2005, I heard on recording, Jennifer Davies, who was Salvatore’s Postgraduate Studies mentor, subject Salvatore to a series of insults and acts of harassment, saying that Salvatore should ‘lose’ his ‘thick Italian accent’ and accusing him of ‘flirting with’ and ‘hectoring’ students amongst other things. On 20 April 2005 or thereabouts, I accompanied Salvatore to meet with Neil Gordon, Personnel Services Manager for the University. We asked for advice about how to complain formally about Jenny Davies. Neil Gordon said that he would not advise, but would only tell Salvatore which policy was applicable. At the same meeting, Salvatore made Neil Gordon aware of the irregularities in the conduct of his probation by the University. Salvatore also raised an additional complaint regarding Peter Musgrove who had refused to replace the chair assigned to Salvatore for use in his office since the start of his employment, which was broken and unusable. Neil Gordon did not take note of these grievances and refused to advise or help him. These grievances were again raised in a meeting between Salvatore and Robert Moreton at around the same time, of which I heard a recording. Robert Moreton sounded as though he did not want to accept Salvatore’s complaints and sounded annoyed that Salvatore was bringing them forward. They discussed the misconduct of the probation process by Helen Ashdown and Salvatore agreed to complete the forms although the probation procedures had been breached, so that his complaints could be recorded formally and addressed. Robert Moreton promised to investigate all his complaints. Robert Moreton said he regarded the conduct of the colleagues Salvatore complained about to be ‘unprofessional’ and later sent an email with an attachment, which I saw, stating this. On 15 July 2005, I heard a recording of another meeting between Salvatore and Robert Moreton. Salvatore again pointed out his unresolved complaints, referring to a bullying culture in the department and Robert Moreton promised to investigate, citing specifically a complaint against a colleague, Tony Mansfield. He said he needed to adjourn the meeting for this purpose and promised it would resume in a couple of days, but this never happened. On 12 September 2005, I accompanied Salvatore to see Roger Williams, Head of Personnel for the University, for Salvatore to denounce a breach of contract as a result of the way his probation had been mismanaged by the University. On 13 September 2005, I accompanied Salvatore to a pre-scheduled meeting with Robert Moreton and Neil Gordon. It was established during this and a subsequent meeting that Salvatore’s probation had been successfully concluded on his part and that there had been a breach of contract arising from the mismanagement of the probation by the University. During the meeting on 13 September, Salvatore complained of harassment by Robert Moreton saying he had used the phrase ‘bloody Italians’ during a public speech he had made in September 2004, after Salvatore had introduced himself as a new member of staff. Robert Moreton admitted to this but laughed, which made me feel angry and sick. Personnel Manager Neil Gordon did not do anything when the issue was raised and did not offer Salvatore any advice or assistance. Salvatore met with Peter Musgrove on 11 October 2005 or thereabouts. I heard a recording of this meeting, which was very informal. Peter Musgrove talked about some problems experienced by other staff in the past and suggested that Salvatore should ignore breaches of procedures in the department. There were no targets set for Salvatore about research or otherwise and Peter Musgrove did not suggest during this meeting that there was any issue with Salvatore’s performance, including his ability to follow procedures. At around this time, I accompanied Salvatore to the Personnel department. He informed Personnel that appraisal was not being carried out within the SCIT department. While Personnel confirmed that appraisal was mandatory for all staff, they did not record the grievance. On 10 November 2005, Salvatore was unwell and couldn’t go to work. The day before, I had been at the University while Salvatore had given an extra workshop for students for a module called CP1045 at 2pm and he commented afterwards that the students were ready to submit their coursework the following day. On the morning of 10 November the University was informed of Salvatore’s ill health. The same morning I took a phone call from Stuart Slater, a colleague of Salvatore who would teach the class in his absence. I took a contact number and when Salvatore was feeling well enough, he returned the call. Stuart Slater asked what he was supposed to teach. He seemed concerned because he had not attended previous classes or meetings and was consequently ignorant of the module contents. Salvatore told him the students were ready to submit their assignments. Stuart Slater promised to publish the slides of his class on ‘WOLF’ (the university online learning environment). He seemed content at the end of the phone call and did not at any time suggest that there was any problem in understanding the assessment. On or around Friday 11 November 2005 I heard a recording of a meeting between Salvatore and Peter Musgrove. Salvatore explained that he felt that the granting of an extension by Peter Musgrove to the students on CP1045 for the coursework due on 10 November, was an act of bullying and a direct breach of the university procedures. He said the extension was unfair to both him and the students. Peter Musgrove was clear that he had been approached by Jas Singh and Stuart Slater and had granted the extension, but that this was an “error of judgment”. Peter Musgrove nonetheless refused to withdraw the decision, apologise or even admit his error to the students and others involved, saying he was interested only in keeping the students happy. On 14 November 2005 or thereabouts, I heard a recording of a meeting between Salvatore and Kamal Bechkoum discussing the formal grievance entered by Salvatore against Peter Musgrove. Salvatore said the students had been ready to submit their work the day before. Kamal Bechkoum admitted that the granting of the extension had been an “error of judgment” by Peter Musgrove. Salvatore was very clear that he believed an investigation needed to take place and the meeting ended with an agreement that they would meet with Peter Musgrove to discuss the grievance the following day. I saw Salvatore very stressed by these events and the continuing bullying towards him. He felt unable to go to work the next day. He was on sick leave from 15 November 2005 until 12 December 2005. Salvatore returned to work on Monday 12 December. He was still very unwell and at 5.45pm on Wednesday 14 December 2005, I accompanied Salvatore home as he was feeling very distressed and sick. I understood from our conversations later that he felt that Peter Musgrove and Steve Garner, a colleague he was working with on a module, were setting him up to look inadequate in front of students. On 15 December 2005 or thereabouts, I spoke with Robert Moreton by telephone to ask for Salvatore’s leave to be authorised to allow him some time to recover. It was also established during this conversation that Salvatore would have a return to work meeting when he went back to work. I told Robert Moreton Salvatore wanted some independent advice regarding the bullying he had experienced from the University but was very clear that he was not refusing to have a return to work meeting as this was also his wish. Robert Moreton said that getting advice was Salvatore’s prerogative and that some forms would be filled out about Salvatore’s illness on his return to work. Salvatore remained off work until 09 January 2006. He was ill throughout his leave and attended hospital on 25 December with a serious Bronchial infection. When Salvatore returned to work he was clearly still unwell with stress. On 11 January 2006, I accompanied Salvatore due to his ill health, to a meeting with Robert Moreton. Whilst we waited outside his office, Robert Moreton acknowledged Salvatore’s ill health and told us that the meeting was an appraisal meeting. After we entered his office a few minutes later, Robert Moreton immediately said that the meeting was not going to be an appraisal meeting after all. He said he had not made any enquiries but questioned what had happened the previous day with Peter Musgrove. He was referring to an argument between Peter Musgrove and Salvatore. Without discussing the matter in any depth, Robert Moreton then suspended Salvatore by reading a scripted text from a piece of paper. I asked if he was also suspending Peter Musgrove for his actions. He said no and repeatedly read from his piece of paper whenever a question was asked. Salvatore questioned Robert Moreton’s motives and asked repeatedly why Robert Moreton was suspending him and what he had done wrong. Robert Moreton refused to give any reason relating to the content of the argument and just kept reading from his piece of paper. He only seemed interested in the fact that the argument had been loud and nothing to do with what was said. The meeting was undignified and seemed to have been prepared beforehand by Robert Moreton. Robert Moreton did not seem at all interested to establish the facts of the matter. As a result of the argument with Peter Musgrove, a hearing was held in February 2006 resulting in Salvatore receiving a disciplinary warning. Salvatore was refused a request to call me as his witness at both this and the subsequent appeal. I heard a tape recording and clearly heard the Chair promise at the conclusion of the hearing to engage in a process to address the causes of Salvatore’s stress and the instances of bullying. He also stated that the grievances outstanding that Salvatore had entered, should be progressed by the University. In January 2006, Salvatore and I met with the University Occupational Health Advisor, Vicky Ubhi, at Salvatore’s request. Vicky Ubhi was told of the pending disciplinary action and of the bullying Salvatore had received. At Salvatore’s request, he and I also met with the University Occupational Health Physician, Dr O’Connell on 26th January 2006. Both Vicky Ubhi and Dr O’Connell were fully aware of the causes of Salvatore’s stress within the bullying he had experienced at the University. A subsequent report by Dr O’Connell discussed later with Vicky Ubhi in another meeting I attended, suggested that the grievance against Peter Musgrove should be addressed as a matter of urgency. After Salvatore returned to work on 13 February 2006, I heard recordings of two meetings between Kamal Bechkoum and Salvatore. Although Kamal Bechkoum heard from Salvatore regarding the causes of his stress, he did not offer to investigate and did not question Salvatore about how the University could assist his return to work. The emphasis was upon Kamal Bechkoum communicating to Salvatore what he needed to do to catch up with his work and seemed to be more an exercise of reinforcing the disciplinary sanction imposed. He did not offer to address the grievance against Peter Musgrove or any others and said that he would be acting as Salvatore’s line manager for the time being. During these two meetings, I heard Kamal Bechkoum agree that Salvatore would take a lead role in the development of the HCI curriculum and the revalidation process for the coming year. There was no mention of how Salvatore’s stress would be addressed or discussion about what the University might to do to help, despite a request from Salvatore to this effect. Salvatore again became ill with stress after further incidents and took time off work in May 2006. On 15 May 2006 I wrote to Vicky Ubhi expressing concern at the lack of effort by the University to address the causes of Salvatore’s stress and failure to implement their own procedures. I requested that she ensure the return to work procedure be properly implemented. On or around 19th May 2006, I was present when Salvatore asked Vicky Ubhi for a meeting with herself, personnel and Salvatore’s line manager in accordance with the University’s stress absence procedure, as no such invitation or any other contact had been forthcoming from the University and they had not implemented the procedure. I heard a tape recording of the resultant meeting, which took place on 30 May 2006. I heard Salvatore state clearly that he did not feel it would help to pursue a grievance. He asked for an independent investigation into this and the other causes of his stress to be conducted, to which Kamal Bechkoum and Neil Gordon agreed. On 03 July 2006 I heard a recording of a meeting between Salvatore and Andrew Bridges, who had been appointed by the University to carry out the investigation. During the meeting, it was agreed that Andrew Bridges would look at Salvatore’s personnel or other files held by the University for details of previous grievances Salvatore had entered, as Salvatore did not want to describe them again. Salvatore talked about some earlier incidents of bullying and harassment and then described how on 08 May 2006, colleague and union representative John Roche had intentionally disrupted an assessment presentation with some students which Salvatore had been chairing and how John Roche had on the same day walked over and slammed the door of the office they shared, in the faces of Salvatore and another colleague, Ros Hampton. Andrew Bridges said that he would speak with John Roche and other relevant individuals and seemed to be content to continue his investigation based on the information Salvatore had provided. He was clear that he could contact Salvatore for any further details. In November 2006 I contacted Ros Hampton by telephone to ask her about the incident involving John Roche on 8th May 2006. She admitted to me on the phone that she had been upset by the incident but did not pursue a grievance against John Roche. She initially agreed to write down her feelings about the event, but shortly afterwards changed her mind and refused to help, saying it was because I had asked her, rather than Salvatore himself asking her. On 31 August 2006, I heard a recording of a meeting with Kamal Bechkoum. The day prior, I had accompanied Salvatore to a meeting with the Head of Personnel, Roger Williams, to complain because a request made several weeks prior by Salvatore to Kamal Bechkoum for the reimbursement of expenses incurred by Salvatore for timetabled activities in March 2006, had been ignored. The meeting with Kamal Bechkoum took place as a consequence of this meeting. During the meeting, I heard Kamal Bechkoum threaten Salvatore in a disciplinary way. He refused to explain why he had not approved reimbursement of the expenses, despite requests from Salvatore. He told Salvatore that all expenses needed “authorisation from Rob” beforehand. He further added that authorisation was needed to submit a paper to a conference. Salvatore pointed out that this was not what the finance website and university procedure required. Kamal Bechkoum was reluctant to listen and gave Salvatore an ultimatum of being disciplined or leaving. Salvatore said that he would leave then, indicating that Kamal Bechkoum was not in his right to discipline him for following normal procedures. On 12 September 2006, I heard a recording of a meeting between Salvatore, Kamal Bechkoum and Neil Gordon in which the results of the stress investigation conducted by Andy Bridges were reported. During the meeting, Salvatore emphasised that he did not feel the investigation had been conducted appropriately and not as had been agreed with Andy Bridges when they had met previously. Kamal Bechkoum said that Salvatore would be provided with another office, as he had been working out of the coffee bar since May after the incident involving John Roche. On 13 September 2006, I heard recording of a meeting between Kamal Bechkoum and Salvatore. During the meeting, Kamal Bechkoum acknowledged that Salvatore had never had appraisal before then. Various research and curriculum development objectives for Salvatore were discussed but no reference whatsoever was made during the meeting to any disciplinary issues or allegations of misconduct or other problems. On 14 September 2006, I heard a recording of a meeting between Salvatore, Kevan Buckley and Robert Moreton. Salvatore had requested this meeting to clarify some issues concerning Salvatore and Kevan Buckley. Salvatore submitted a written complaint about events involving Kevan Buckley and in particular his previous insinuation that Salvatore should resign from the Learning and Teaching Committee. However, Robert Moreton refused to accept the document, making clear that he wanted no record of the grievance. Salvatore explained how he had raised his complaint verbally during a previous learning and teaching committee meeting, but that Kevan Buckley had not responded. As Robert Moreton had claimed that Salvatore had “stormed out” of the committee meeting, Salvatore asked who had made such an allegation. As I had heard a recording of the committee meeting, I knew that Salvatore had in fact left quietly and without comment several minutes after raising his complaint. Robert Moreton refused to say who had made the allegation and was clearly not interested in investigating. He accepted without question when Kevan Buckley claimed to have received an email of resignation from the committee from Salvatore. Salvatore asked Kevan Buckley to produce the email, but Kevan Buckley said he would only do so after the meeting. Robert Moreton then began a critical tirade against Salvatore, telling him that “people don’t like your perceptions” or words to that effect. There was no resolution at the end of the meeting, which had been turned into an attack against Salvatore by Robert Moreton, supported by Kevan Buckley. Robert Moreton was not interested in receiving the email Kevan Buckley had referred to and refused to allow Salvatore to lodge his grievance formally in writing. On 11 or 12 October 2006, Salvatore again became ill with stress and worsening depression. He could not face going back to work after being away. We sought to see a GP and the doctor confirmed that Salvatore should avoid the stress of work and began a course of treatment for Salvatore’s stress, anxiety and depression. Throughout this time my primary concern was for Salvatore’s health. I was extremely worried to see him so ill. He would become suddenly highly agitated. He also would suffer tremendous periods (from hours to days) of distress, anxiety and depressiveness, often sleeping for most of the day and rarely going out. Salvatore was called to a disciplinary hearing for 18 October 2006 but he was absolutely unfit to represent himself or attend such a hearing at the time and it was postponed. On 10 November 2006, I accompanied Salvatore to meet with Maggie Burton, the University Occupational Health Advisor. Salvatore had requested the meeting by phone on 09 November, after receiving no contact from Occupational Health since he went off sick. During the meeting, the instances of bullying and harassment were recounted in detail. I handed Maggie Burton a letter describing some of my observations regarding Salvatore’s symptoms and Salvatore also left with her a written grievance regarding the lack of support up to then received from the University to address the causes of his stress. She expressed her opinion that Salvatore was not fit to return to work. She did not make any assessment of Salvatore’s health and neither did she refer to any medical evidence. She offered Salvatore the choice of seeing the Occupational Health Physician, which he declined and she accepted this. It was agreed that Salvatore’s General Practitioner could be contacted by Maggie Burton for his professional opinion. Towards the end of the meeting, I stated very clearly that I expected her to follow the procedures this time to help Salvatore return to work in a fair way, as the university had previously failed in this respect and she promised to do so. On 24 November, I phoned to Maggie Burton to complain about a report she had written to Neil Gordon after our meeting on 10th November 2006. I told her I believed her conduct was not befitting of a health professional and that she was not interested in Salvatore’s wellbeing. I made her aware that I had a detailed record of the meeting we had held and that her report was a false record of it. I told her that Salvatore was not fit to attend a disciplinary meeting and that I was disgusted by the report she had written because it did not reflect what she had said at the meeting we had at all. I made her aware that Salvatore was also feeling worse and now did not feel like leaving the house at all. On 27th November 2006, I sent a fax to Geoff Hampton, explaining that Salvatore was not well enough to attend or represent himself at a disciplinary hearing and was still on certified sick leave. He subsequently phoned and told me that he would not want to proceed with any disciplinary hearings for any member of staff who was not well enough and said he would postpone the hearing. Between December 2006 and March 2007, a number of appointments were scheduled with the occupational health physician of the University, which were cancelled because Salvatore did not feel well enough to attend and was receiving treatment from his GP, who would often visit him at home when he felt too ill to attend the medical practice. In or around January 2007, I telephoned to Dr O’Connell, the Occupational Health Physician Salvatore had previously met with. I told Dr O’Connell that the recommendations he had made in his previous report had been ignored by the University. He responded by telling me that the university could choose to ignore his reports, saying something like ‘I can say A and they do B’. Salvatore’s health was worsening during this period. In January 2007, his GP wrote to the University. After the reassurance from Geoff Hampton, I believed that the University would consider and act on this medical report, which again pointed to the causes of Salvatore’s stress illness. Each time Salvatore was reviewed by his GP, I sent the sick note in to the University by post and/or fax. On 16 April 2007, the GP reviewed Salvatore at home, because he was too ill to attend the medical practice. Just before leaving, he contemplated writing to the university to see if he could help but said that they should really contact him first. I sent confirmation that Salvatore was still unwell to the University by fax the same day and sent the sick note by post afterwards. On 18 April 2007, a special delivery card was left by the Royal Mail whilst I was out and Salvatore was sleeping. I did not know what this related to or who it was from but only that it was for Salvatore and that he felt too ill to either collect the item or deal with any correspondence. On 24 April 2007, I came into the house to find that another Special delivery card had been delivered. Salvatore was very agitated and disoriented and had been sleeping on the sofa. He explained that someone had been banging loudly on the window and had woken him. He said he hadn’t realised it was the Royal Mail but had indicated that he was not able to come to the door. Salvatore was upset. At that time, he was not well enough to collect the item or deal with any correspondence. On 03 May 2007, I was shocked when Salvatore received a letter, wrongly dated 01 April 2007, enclosing notes apparently taken at a “Stage 4 (Dismissal) hearing”. I understood from reading the notes that the respondent had dismissed Salvatore in his absence and that the 5 days allowed for appeal had already elapsed. I was surprised that the hearing had been so short and could not understand from the notes what evidence or individuals were being referred to. I did not know at the time that the hearing was taking place. The University had made no attempt to contact Salvatore by ‘phone, email or regular post, despite having done so before the previous disciplinary hearing. Because I had forwarded medical evidence to the University, they were aware that Salvatore was not fit to attend a hearing. They were also aware that he did not know about the hearing and he did not have chance to appeal. Salvatore Fiore’s witness statement of what he had to undergo whilst employed at the University of Wolverhampton. I am currently studying for an MBA in Education at Keele University. I have a MPhil Computation Human-Computer Interaction, UMIST (University of Manchester), a Postgraduate Certificate in Learning & Teaching in HE, University of Wolverhampton, a BSc (Hons) Business Information Technology, Open University and an HND Business Information Technology, Brunel University. I also have Professional qualifications as a Fellow of the Higher Education Academy, Chartered Scientist of the British Computer Society / The Science Council, Chartered Member of the British Computer Society and a Chartered IT professional of the British Computer Society. I have worked hard to achieve my qualifications and was keen to get the position as a senior lecturer at the University of Wolverhampton. I started working as a Senior Lecturer in Computing at the School of Computing and IT on 1 September 2004. My terms of employment were set out in a letter of offer of employment dated 21 July 2004. At the section headed Duties and Hours of Work it specifically stated that my duties included “teaching and tutorial guidance, research and other forms of scholarly activity, examining, curriculum development, administration and related activities”. I was keen to be given the opportunity to carry out the full range of these duties. My optimism about my new role was fairly short-lived, as within about one month of starting the job there was news of redundancies at the University. I knew from an early stage that I did not like the management style of Robert Moreton, the Dean of the school. I recall a meeting with him when I first started working at the University whereby he told me that he was proud at how well he looked on a photograph on his wall when other members of staff looked old and worn out. As he was my manager I was not impressed by this attitude. On 20 September 2004, I attended a ‘Dean’s Address’. Nearly all members of staff of the School of Computing and IT (“SCIT”) as well as some external members including members of the Executive Board were in attendance. I and other new members of staff were asked to stand and present ourselves. I felt uncomfortable about being told to stand up. At my turn, Robert Moreton asked me to stand with a gesture, which I did. Robert Moreton then continued presenting and in a rapid succession of words, said the phrase "bloody Italians". Nobody in the room offered even a glance of disapproval for this remark and whilst leaving the room afterwards, I said to a colleague how shocked I was after this remark, but he didn't respond. I deny that I exhibited relationship difficulties with my colleagues. This suggests that I was the sole cause of these problems. I in fact felt that I experienced some bullying during the first few months of my employment, firstly involving colleagues Alison Bunce and Tony Mansfield and reported this first to my line manager Peter Musgrove at two meetings in October or November 2004. Peter Musgrove told me he would investigate but came back at the second meeting dismissing my complaint by saying that Alison Bunce had problems, in a way that made me understand she had some sort of mental problems or similar, and I should just forget about the incident. During these meetings, we also discussed some conferences I wished to attend as part of my research activity and staff development. Peter Musgrove told me that there would be only £2000 available each year for staff development. I told him that I was paying my own PhD fees. In December 2004, I was approached by Helen Ashdown to tell me that I needed to participate in probation meetings. She had been assigned to supervise my 12 month standard probation period. When I received the forms then for the first time, I saw that these meetings should have taken place from September 2004. We had various probation meetings between December 2004 and July 2005, during which I raised various complaints about the bullying and unprofessional conduct by some colleagues. Helen Ashdown told me that she hated filling out the forms and was very reluctant to do so. The meetings were very unpleasant as Helen Ashdown would always refuse to address my complaints, instead dismissing them by telling me I should adapt to the culture of the School and commenting that nobody liked to work with me. We discussed many of my ideas for curriculum development but Helen Ashdown repeatedly told me I could not participate in curriculum development at that time, though I could not understand why as it was part of my contract and job description. She suggested that there would not be enough hours to give me a full timetable. This made me fearful of redundancy. During this time, none of my grievances were addressed and Helen Ashdown twisted the facts and blamed me for the majority of the complaints that I raised. As part of the requirement for my job I had to complete a Postgraduate Certificate in Education. I was given a mentor, Ruth Fairclough and had a nice stable relationship with her. Unfortunately the University changed my mentor without giving me any explanation or reason. This change of mentor was unprecedented and I felt a level of mistrust as a result of this unexplained change. Whilst the University allege that I had instances of relationship problems in the first months of working at the University, I do not agree with this. I had some disputes, which I tried to resolve. One issue was that the other staff failed to provide me with the slides and teaching materials that I needed to do my job properly. When I told Robert Moreton he agreed with me that it was unprofessional conduct by the other members of staff. Only one grievance was investigated at this time despite the fact that I, accompanied by my partner, Melody Boyce, also met with Neil Gordon, Personnel Services Manager for the University about them. At the meeting on or around 20th April 2005, I told him of my grievance against Jenny Davies, as well as the irregularities in the conduct of my probation and problems with health and safety. I also complained to him about Peter Musgrove because he had refused to replace the broken and unusable chair I had been assigned in my office since my first day of employment and had said it was ‘good enough’ for me. Neil Gordon did not take note of these grievances and told me he could not advise me, except to tell me which procedure to follow. In April 2005, I met with Robert Moreton to enter the grievance against Jenny Davies formally. During the meeting we discussed the other outstanding grievances and the misconduct of the probation process by Helen Ashdown. Because Robert Moreton promised a full investigation into my complaints, I agreed to document them on the ‘mid-term’ probation forms, despite the fact that the procedures for completing these had been breached by Helen Ashdown. Robert Moreton was clear that he regarded the conduct of the colleagues I was complaining about to be “unprofessional” and he later confirmed this by email attachment to me. A few days later I had an informal conversation with John Roche, a colleague and NATFHE Union Representative in SCIT. He tried to persuade me to withdraw my grievance against Jenny Davies, because I was still a probationer and suggested it could cause me to fail my probation. I felt intimidated by this and made him aware that such comments were unwelcome. At some time after September 2005, during another conversation with John Roche, he confessed to me that Robert Moreton had sent him to persuade me to withdraw the grievance against Jenny Davies. The grievance was investigated by Alison Halstead and appeared to be conducted fairly. She took my statements but the statements of Jenny Davies were more of her interpretation of events rather than factual. After I received her report, Robert Moreton interpreted it as though there was no fault with the School whatsoever, although the report clearly indicated serious problems of communication towards me and that he had taken an unprecedented step to remove my mentor without consulting me or my mentor. As a result of the grievance, a new mentor was promised to me in order for me to continue my studies towards a Postgraduate Certificate in Education, without further disruption, although this was never done. On 15th July 2005 I met Robert Moreton in his office. During the meeting we had a general discussion about management and the unprofessional conduct of some colleagues I had already raised, such as Alison Bunce and Tony Mansfield. I told him that there was a cultural problem in SCIT and raised again my serious concerns, as a verbal grievance against Tony Mansfield. I made him aware that Tony Mansfield did not give to me materials necessary for me to teach students during a workshop and that I had heard Tony Mansfield telling a student to ignore me. He told me he would investigate and asked me to provide the email exchanges between myself and Tony Mansfield (which I promptly forwarded to him after the meeting). He adjourned the meeting, promising to resume when he had investigated this complaint. This never happened and the grievance was never resolved. I was never offered any report or feedback of meetings about this or other grievances, despite repeated promises to do so from the University. On 12th September 2005, I went, accompanied by my partner, Melody Boyce, to see the Head of Personnel, Roger Williams to complain about the mismanagement of my probation due to the fact that I was not presented with relevant information and forms by management of SCIT and the personnel department in time. Moreover, I complained that due to the fact that the probation meetings and paperwork relating to its procedure had been mismanaged by Helen Ashdown, my probation supervisor. As such I claimed the breach of contract. Subsequently, a meeting was held with Robert Moreton and Neil Gordon, at which my partner was also present, at which it was confirmed that the probation had been passed successfully. In September 2005, I met Peter Musgrove in the ‘common area’ of the office neighbouring mine. We were speaking about the relocation to the new offices and he made me aware that there was an agenda already established with regard to research and careers in the department. He told me that a new member of staff, Rupert Simpson would be located in my office and that he would ‘go higher’, making me understand that he would make a very rapid career progression. I was puzzled about how he could be so certain about this. He continued telling me that there were arrangements with regard to research in the department and that some would do research like Quasim Mehdi and his research group and that these individuals too would go higher up. He then said that I ‘would be involved in research too’, but as he said so, he made a gesture downwards with his hand and a disparaging expression with his face, that made me feel he was certain that I would not do well in the department. I was further perplexed as I understood that career progression in the university was regulated by appraisal, by contract and not by sponsorship. On 11th October 2005 or thereabouts, I met Peter Musgrove in the annexe of the Costa Coffee bar on the University main campus for an informal chat without a fixed agenda. The chat was mostly referring to some of the suggestions he had to give me with regard to how to approach members of staff. He made me some propositions that I should ignore mismanagement of procedures by others in the department, without looking at the root cause of them. I also told him that I was attending a Masters in education at the University of Wolverhampton and talked about my doctoral studies at the University of York. We discussed the procedure on how to deal with student complaints. We did not converse at all about issues arising with regard to staff relations, students or performance. We did not fix any performance targets in what was a very informal meeting. Since this meeting, I never again met Peter Musgrove to discuss issues of performance or set targets for the purpose of appraisal. In November 2005 I raised a formal grievance about my line manager, Peter Musgrove, which was not investigated. I raised the grievance because I felt bullied and harassed by him. This failure to deal with what I viewed as important employment difficulties was not taken seriously by the University and I became ill. This, compounded by the previous events and unresolved grievances, resulted in extended leave for work-related stress in November-December 2005. In November 2005, I sent an email to Peter Musgrove requesting an appraisal. I did not know about the procedures for appraisal but was aware that it should be done every year. I was concerned that I did not have any targets or recognition of my progress set at the conclusion of my probation. He said appraisal had not been started for the year, which I could not understand as it was already November 2005 and the year had begun in September 2005. I was denied opportunity to participate in appraisal throughout the 2005/6 academic year, despite my repeated requests to Personnel and my line manager Peter Musgrove. Sometime around November 2005 or thereabouts, I went, accompanied by my partner, Melody Boyce, to the Personnel department to let them know that I was concerned about the lack of appraisals in the department. I spoke to a slim, young, black woman, I believe to be named Sam Patterson. After briefly explaining to her the information I had gathered, she said that appraisal should be done at all levels in all Schools, but that she could not do much about it. I was handed information relating to the appraisal process but she did not take note of the event although I was explicit that this was, albeit verbal, a grievance towards the management of SCIT. I was never invited to discuss this with Personnel or others. As a module leader on teaching module CP1045 I issued assignments to students. One particular assignment had to be handed in on 10 November 2005. The day before the hand in date for this assignment I held an additional tutorial to make sure that the students were okay with the assignment. No problems were raised and only one student asked for an extension. As she would not give me a reason for requesting an extension I refused and told her that there were proper procedures to be followed to obtain an extension. On the 10 November 2005 the day that the assignments were to be submitted I was off work due to sickness. In my absence Peter Musgrove gave a mass extension to the students without even attempting to consult me about this. I felt that this was in breach of University policy and undermined my authority and credibility. On about 11 November 2005, I met with Peter Musgrove in his office, in order to ask him about the mass extension he had given on 10th November 2005 to students of the module CP1045. I went to see him in order to find out his motivation and ask for evidence of the need to do so. I began the meeting by telling him that I was off sick for just one day on 10th November and that on the 9th November I had been with the students, giving them extra timetabled tutorials to address last minute questions. At that time, nobody had presented their tutor with an extension request and I did not receive any extension requests from any tutor. I told him that I had reminded the students, as I normally would, that extensions would be allowed only for the circumstances contemplated in the module guide as determined by university procedure. They had to inform their tutor first, who, in turn, in agreement with myself, would have allowed an extension if a reason was valid. I also said that students who need an extension should approach their tutor at least a week before the deadline. Peter Musgrove told me that on the day he had been approached by Jas Singh and Stuart Slater and that by “error of judgment”, he allowed an extension to the students. On this basis, I asked him to withdraw the extension because it unfairly discriminated against some students who had already submitted their work on time. He told me that he did not want to do so because the extension was already issued, so I told him that I would be willing for the students to present their assignments as a resubmission at a later date. He refused this offer from me. I told him that with his extension he was implying that there was fault with my teaching and that he was breaching university procedure. I said that he was bullying me with his behaviour. He was very quick to dismiss me, saying that he didn’t care about staff but was interested in making the students happy. I was dismayed and asked him again if he really was not interested in the wellbeing of his staff, which he confirmed. I then said “I’m sorry, but you are forcing me to put a grievance” and he responded confidently, “yes, put it”. That same day I gave him a written grievance. I also lodged a grievance with Kamal Bechkoum, Anne Latham and Robert Moreton for this matter. I felt that I had to do this to protect my dignity. On 14 November 2005, I met with Kamal Bechkoum in his office to discuss the grievance I had put against Peter Musgrove after he allowed the extension. The conversation began with Kamal Bechkoum illustrating to me some documents for internal moderation in which Jas Singh highlighted some areas for improvement. I pointed out that the assignment was issued after making the suggested adjustments and that no other suggestions had been made by the internal moderator or the teaching team for the module CP1045 (Myself as Module Leader, John Roche and Stuart Slater as Lecturers). Kamal Bechkoum continued telling me about the motivation behind Peter Musgrove granting the extension and admitted that this was due to an “error of judgment” by Peter Musgrove. In a previous meeting with Peter Musgrove, he had also admitted to me that his actions were the result of an “error of judgment”. There was, from Kamal Bechkoum, an admission of this mismanagement and I asked for there to be a clarification between Peter Musgrove and me regarding how to take the module forward, considering my insistence that Peter Musgrove should acknowledge his error to the students. The meeting terminated with an agreement between Kamal Bechkoum and me that these things would be discussed further in the presence of Peter Musgrove and we fixed a meeting for the following day. Due to ill health, I could not attend this meeting. However, after my return to work, I mentioned on various occasions to Vicky Ubhi, Martin-Hedley Smith, Kamal Bechkoum, Robert Moreton and Maggie Burton that the grievance was still unresolved and an investigation was needed. Even Peter Musgrove referred to the fact that this grievance was unresolved in an email. No concerns at all were raised subsequently by the external examiner or any others, regarding the module or its assessment and neither were there any criticisms directed towards my teaching or module leadership. If there were concerns with the assessment regime for CP1045, these would have been highlighted at the exam board and reported to me as module leader as a breach of the quality assurance process. It was in late 2005 after all these events that I started to feel depressed. I would wake up in the morning and feel unable to concentrate or find motivation to do the most elementary things. I would get confused and suffered headaches and other symptoms. I am a very proactive and pragmatic person by nature but I started to feel that all I wanted to do was to sleep all day and I was not up to doing anything. I went off sick after these events due to stress and went back to work on 12 December 2005. On about 12 December 2005 on my return to work, I went to see Steve Garner, a lecturer in SCIT, to discuss the delivery of classes and if there were any issues with the module ‘System development and HCI’ of which I was part of the teaching team. He was aware that I had been off sick for some time due to ill health and so we had a brief chat about the latest developments on the module. He made me aware that there were no major issues and that during my absence other lecturers had covered for me whilst he also prepared the exam paper to be issued to students for the end of semester examination. I was a bit irritated by this considering that I expected to be involved in the design of the exam questions, being part of the teaching team. I asked him why he decided not to involve me and he seemed uncomfortable to respond and avoided answering. He told me that the exam paper should be issued to the students and I made him aware that I was not prepared to do it considering that almost none of the exam questions were related to the part of the subject with which I was familiar and would have taught. I made him aware that I was not going to deliver a paper as the students would inevitably ask questions and they had the right to do so. I suggested it would be in all respects unprofessional for me to do so. He seemed to accept my decision. I also asked him why, unlike previous years, there were hardly any questions in relation to the part I taught, and suggested to him that this was intentional by him because the paper should have been finalised for internal moderation some considerable time before I went on sick leave in November. When I reminded him about this and told him I felt isolated on the module and that what he had done was not a fair practice for the students and that he was breaching the external quality assurance processes of the quality assurance agency, he quickly dismissed me, saying that Peter Musgrove told him to ignore the HCI questions purposefully because I went off sick. At that point, I made him aware of the very low esteem I had for him and left his office. Steve Garner subsequently sent me an email asking if I was able to deliver the exam paper, to which I responded again, that I was not. On 13 December 2005 I sent an email to SCIT staff. I believe that I was making valid comment about the situation that I had been put in by the University. I did not trust peer observations after I had experienced first hand how the system could be abused, when my mentor Jenny Davies had previously compiled blatantly contradictory reports for quality assurance and staff development purposes. In January 2006, I had initiated contact with Vicky Ubhi, the university Occupational Health Advisor and their Occupational Health Physician. The physician had reported that my grievances should be addressed and I was expecting a support for return to work in accordance with the university procedures. I was offered counselling but I asked for a couple of weeks to reflect on whether I wanted counselling. The offer of counselling suggested that I had a problem, which I had caused. 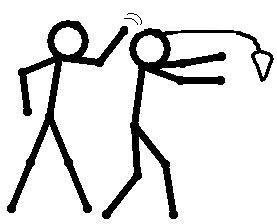 In January 2006 I returned to work but felt that I received no support and immediately upon my return to work I had an argument with my line manager, Peter Musgrove, against whom there was already an unresolved grievance. I was still very stressed at the time. He did not ask for my reasons why I did not want to deliver the exam paper. This was too much for me to take. I felt as if he had intended to make me break down. I did not make any physical threats and had no intention to offend Peter Musgrove. Disciplinary action was taken against me as a result of this argument leading to a 12 month Level 2 warning on my file. In December 2006 I learned from my Occupational Health file that, following a meeting between the Dean, the Association Dean and Occupational Health Adviser in December 2005, it had been agreed that I should not have to have contact with Peter Musgrove whilst the grievance remained unresolved. This relevant fact was withheld from the disciplinary proceedings. If this decision had been implemented, the argument and subsequent disciplinary action would never have taken place, and if the information had been present at the proceedings, it may have altered the outcome. Not only did this affect this particular disciplinary sanction against me, as my dismissal was based on a breach of the warning arising out of this incident, the implications of this failure by the University to take into account the recommendation by the Occupational Health Adviser and what had been agreed at that meeting has had very serious consequences for me. I was annoyed with Peter Musgrove and was showing my anger. I did not make any offensive comment to him, and I understand that the problem was the level of my voice. Despite this on 11th February 2006 I was disciplined by being given a Stage 2 written warning, which was to be kept on my file for a period of 12 months. I appealed but it was unsuccessful. At the disciplinary hearing I presented my defence to the chair, Geoff Hurd. Robert Moreton had collected evidence in the form of statements from members of staff and Geoff Hurd accepted them as valid evidence for the hearing. I noted that an email sent by Robert Moreton to request evidence from members of staff, had precisely the same date and time as those of response containing witness statements. I felt that the evidence presented by Robert Moreton was flawed and that the Chair did not appropriately weight this. I asserted this at the appeal hearing on 3 April 2007. During the hearing, I discovered that nobody of the panel had made the Chair aware that I had immediately prior to the incident, been off sick with stress and that there was no record of my illness in my personnel file. The chair also failed to take the reason for my behaviour into account. At the conclusion of the subsequent appeal, the chair for the University Gerald Bennett, stated that the outstanding grievances I had entered previously should all be progressed and a brokered attempt at resolution be made. This never occurred despite my persistent requests. On 16 January 2006, I notified the Vice Chancellor, Caroline Gipps, in writing that I felt that I had been subjected to bullying and harassment and that the disciplinary action was not being conducted fairly by the Dean. She declined to investigate or meet with me. On 13th February 2006 or thereabouts, Robert Moreton appeared unexpectedly in my office. He asked to meet with me, but I told him I was busy at the time. First he offered me a choice of when to meet but when I said I was in the middle of some work and would fix a time with his secretary, he changed his mind and said he wanted the meeting there and then. He closed the door and then behaved in a domineering way, forcibly and repeatedly (more than three times) asking me to send an email to all SCIT staff apologising to Peter Musgrove. I told him that considering the circumstances I didn’t feel an apology was needed and considering that I had already been given a penalty, such an apology would serve neither one of us. He eventually stopped his insistence and before leaving, told me that Kamal Bechkoum would be my line manager for a while. I felt uncomfortable with this as it meant reporting directly to an Associate Dean and higher level of authority than required by contract and this felt like yet another disciplinary sanction and breach of contract and effort to control from which I would not benefit in any way. On 15th February 2006, I met with Kamal Bechkoum in order to agree a return to work plan and address the issues, which were causes of my stress illness to date. During the meeting, we spoke of some incidents of bullying which I had experienced and about the behaviour of some colleagues. Kamal Bechkoum tried to minimise things, always referring to me with paternalistic examples of conflict resolution drawn from literature, which were not at all related to the circumstances, I was describing to him. I felt that he was not taking the situation seriously. At this point I felt more and more isolated from the other staff. I started to feel that the University were ignoring me in the hope that I would resign. During this meeting or soon afterwards I mentioned to him that I was carrying out some research work with a part-time student and that it was my intention to submit the research work to the EAERCD and IADIS conferences, with a further possibility to submit to a journal for publication. He told me that I could also focus more on the discipline in which I specialise, Human-Computer Interaction (HCI) and I made him notice that the work was indeed relevant to this field. He also promised during the meeting that I would take a very important role for curriculum development during the revalidation process. In particular, he said that I would take a lead role in HCI. He said this after I told him that I had requested to Helen Ashdown during my probation, for opportunities to develop new modules. I also made him aware that Peter Musgrove had promised me active involvement in curriculum development meetings. He asked me about the tasks which I had fallen behind on due to my absence and was keen to discuss this to some extent. The day afterwards, we met again and discussed in detail the backlog and the tasks I had to carry out soon. I also explained that this was my return to work after long term stress‑related absence and prompted him to seek a resolution of the events and the causes of my stress with the intention to solve them. I wanted, as also requested by Robert Moreton, to follow the procedure for return to work in accordance with the stress policy, but this was disregarded, ignoring the University’s stress policy. The only record Kamal Bechkoum provided to me was a list of tasks I was required to complete to rid my backlog. There was no mention at all, even subsequently, of how my stress would be addressed and no plan was proposed to address such issues for the future, although I requested it as this was an ongoing situation, raised also previously with Peter Musgrove. On 8 May 2006 I was bullied on two separate occasions by John Roche. First, he had, without any provocation, slammed the door of the office we shared whilst I was standing in front of it, talking to Ros Hampton. Later the same day he had constantly interfered with and overruled me whilst I was speaking with the students and examining student presentations, causing the session to be aborted. A few days after this event, I was stopped in the corridor by Kamal Bechkoum. He told me he had spoken to Robert Moreton about my previous request to remove John Roche from the reiteration of the presentations he had disrupted on 8 May 2007 and that Robert Moreton had said they could not do so because he was a union representative. He was not concerned at all about the stress this was causing me. Following a further absence for stress in May 2006, I was concerned that neither SCIT, Personnel nor the Department of Risk, Safety and Health, were encouraging the application of the University’s stress policy. In particular, I was not given opportunity to discuss my illness and the causes of my stress beyond confidential sessions with the Occupational Health Adviser. No action was undertaken by the University to address the situation. For example, no plan had ever been instigated, either involving me or of which I was aware, to investigate, monitor or address the situations causing me stress. As a consequence, I took the step of expressly requesting to Vicky Ubhi, in the presence of my partner on 19 May 2006 or thereabouts, that the University should follow the stress procedure to guarantee my health and wellbeing. A meeting took place on 30 May 2007 with me, Vicky Ubhi, Neil Gordon and Kamal Bechkoum present. At the meeting I felt that Neil Gordon was orchestrating who should say what. For example, as I turned towards him at one point, I noticed him making signs to Vicky Ubhi and Kamal Bechkoum behind my back. At this point I felt that he was not interested in helping me address the problems but only in controlling what was said to me and who should speak. I requested that an investigation into the causes of my stress be carried out. I was very clear that I did not intend to pursue a punitive approach via a grievance, as I was interested to address the causes of my stress and the bullying I had experienced in SCIT. As a result a “Stress Review” was carried out at my instigation to investigate the causes of stress in the workplace. During this investigation, no witnesses were spoken to and no evidence was looked at. No attempt was made to establish what had happened to me. The Investigator refused to look into allegations of bullying, lack of appraisal, racial harassment and breaches of contract. The sole recommendation was that I should be provided with a suitable office; ironically this was never implemented and I was without an office from May 2006 until my dismissal. On 03 July 2006, I met with Andy Bridges for investigation into the causes of my stress. I met him in his office in the University’s School of Applied Sciences, to discuss and for him to take my witness statement with regard to the causes of my stress in SCIT. At the beginning of the meeting, he told me that he would also gather views from John Roche and that he did not have any knowledge of what he was doing. He asked me to explain to him the causes of my stress and I made clear that I was there to discuss the case of myself feeling bullied by John Roche in SCIT. I made him aware that I wasn’t there to revisit all the previous grievances, although I was very clear that for him to get a grasp of the stressful situation I been through during my employment, he could revisit my Personnel file and look at the grievances I had already put through during my employment with the University. He took note of this. I proceeded however, by making him aware of some of the events occurring during my employment, which created stressful situations for me. He agreed to look at these separately through my personnel file or files held by the University about me. By the end of the meeting, he made me understand that he could contact me if he needed further clarification and that he was happy with all the information and he would proceed with the investigation. In July 2006, I made the Dean, Robert Moreton aware that my contract was not being implemented fully and that I was not being treated fairly. The Deputy Vice Chancellor was also notified that promises made during the prior disciplinary proceedings to investigate and address the circumstances causing my stress had not resulted in any actual improvement. On 27 July 2006, I sent an email to my colleagues in SCIT in reply to an email from Michele Palmer about a new marketing policy. I was concerned about how the policy would avoid discrimination to members of staff and students. She initially misinterpreted my email as criticism of her and so I clarified to her and offered to do so to the other recipients that I was only talking about the policy. I also apologised for any misunderstanding to her. Robert Moreton took the opportunity to discipline me by email without giving me a chance to explain. I felt annoyed that he was attempting to limit my academic freedom and expression, as my critique in relation to the policy was academically founded and intended to be constructive, within the normal scope of academic debate. Later, in collating this exchange of emails as part of the evidence against me for disciplinary action, Robert Moreton excluded from the evidence my emails, which clearly outlined the academic basis for my comments. In July I put in a claim for my expenses for visiting two students in London and New Milton in relation to their work placements. The combined claim was for £292. I forgot to put the expense claim through immediately following the visits and I only made the claim after 3 or 4 months at the start of the holiday period. Kamal Bechkoum asked to see me about the expense claim. He refused to deal with the claim by email. I felt that this was odd as the expense claim did not need to be authorised by management. On about 31 July 2006 I met with Kamal Bechkoum and asked what the problem was with my expense claim as it had been authorised by the placement office. He told me to listen to him or leave. I felt that I was being accused of stealing the money and got up and left. After about 15 minutes I returned and said that if they did not pay me within 7 days I would take legal action to recover the expenses. There was no reason not to pay my expense claim and I was given no reason for withholding the money. Kamal Bechkoum referred the matter to Robert Moreton and he authorised payment of my expense claim within 7 days. As a result of this the University took further disciplinary proceedings against me. On 07 September 2006, Robert Moreton sent me an email clearly offering me the option of being assigned to a University Quality Standing Panel. I replied that I did not wish to undertake the role, as I did not have the right training and was anticipating other duties, including the curriculum development role, previously discussed with Kamal Bechkoum. Robert Moreton ignored my decision and ordered me to be on the Panel regardless. This upset me because I had been excluded from appraisal for the past year and should have had an opportunity to agree my duties in consultation with line management with respect to my skills, experience and aspirations, as stated in my contract. On 20 September 2006 I wrote an email to the Standing Panel to explain that I had been forced into the role and neither wanted to do it nor had the necessary training. Belinda Cross replied to me on the same day, apologising and saying that SCIT had led her to believe that I agreed to the role. On 12 September 2006, I met with Neil Gordon and Kamal Bechkoum in the meeting room of the SCIT ‘Deanery’ to discuss the outcome of the stress review investigation carried out by Andy Bridges. At the meeting, Kamal Bechkoum was very happy with the outcome. Whilst reading the outcome both he and Neil Gordon were smiling. When he concluded, he mentioned that I would be relocated very soon to another office. I told him that I welcomed this decision but that I rejected the overall findings of the investigation because it was flawed and not carried out in a fair and professional manner. I later sent him an email reiterating this. On 13 September 2006 I met with Kamal Bechkoum in his office for an appraisal meeting. He had not followed the procedures because he had already decided on the targets without giving me an opportunity to think about it. During the meeting, he did not suggest that there were any issues relating to my conduct or any problems, which needed to be discussed. I later discovered that he had at the time been, along with Robert Moreton, gathering evidence against me with a view to dismissing me. On 14 September 2006, I met with Kevan Buckley and Robert Moreton in the office of Robert Moreton. I had requested the meeting to clarify some events involving myself and Kevan Buckley and because I wished to complain about events involving Kevan Buckley arising from his insinuation that I should resign from the Learning and Teaching Committee. At the meeting, Robert Moreton started by refusing some written notes, which outlined the reason I had requested the meeting and summarised my complaint. He refused the document, although I told him that this was an informal complaint. He made very clear that he didn’t want any records of the meeting or the complaint itself. However, whilst speaking, he wrote on the document “This an informal complaint”. During the meeting, I had very quickly the impression that both Robert Moreton and Kevan Buckley were not taking the matter seriously and that they were making allegations, which I contested. During the meeting I asked Robert Moreton who told him that I had ‘stormed out’ of a recent meeting of the Learning and Teaching Committee. He refused to reveal a name. I explained again that I had complained politely against the chair, Kevan Buckley, about his insinuation for me to resign but had left the meeting quietly several minutes later. Kevan Buckley told Robert Moreton that I sent him an email of resignation. When I challenged him to present such an email, he first refused and then told me that he would send it to me after the meeting. I was still astonished by this, knowing that I had never sent such an email and said that this was unwelcome and that I felt offended by such false statements and events. Robert Moreton took the occasion to tell me that “people don’t like you/your perceptions”. I was very offended by this and it was unrelated to the matter at hand. During the meeting he never asked Kevan Buckley to present further evidence or clarification of events and was instead defending Kevan Buckley and openly in his favour. The meeting concluded without any resolution or any clarifications being brought about. Indeed, I again asked Kevan Buckley to send the email he had referred to during the meeting and Robert Moreton did not want to receive the email or leave any trace of the discussion. On 27th September 2006, I sought approval to attend a conference and this was granted by Kamal Bechkoum. The following day, I received an email stating that the review and revalidation process I had previously discussed my involvement in with Kamal Bechkoum, would be conducted during my absence via two meetings. This would be my main opportunity to put forward my ideas for the new curriculum. Although I delayed leaving for the conference by several hours to be able to attend the first meeting, when I requested that the second be moved by two days to enable my participation, both Peter Musgrove and Kamal Bechkoum refused, stating it was because the process had a tight deadline. However, the process continued for several months after this. I was very stressed by their decision and felt purposefully excluded. I believe that Robert Moreton had been collating evidence against me for some time, in order to construct a disciplinary case to dismiss me. On about 11 and 12 October 2006 I became unable to work due to severe stress. By a letter dated 03 October 2006 I was asked to attend a Stage 3 disciplinary meeting for an alleged breach of the Stage 2 final warning. A Stage 3 disciplinary hearing was scheduled for 18 October 2006 but was postponed because of my health. On 10 November 2006 I met with the University’s Occupational Health Advisor, Maggie Burton. My partner Melody Boyce also attended. The only reason that this meeting was arranged was because I phoned Occupational Health to ask why they had not contacted me. During the meeting she assured me that I would receive full support to return to work and that I should not return at that time as I was not well enough to do so. However, immediately following that meeting, she sent an email to the Personnel Services Manager, Neil Gordon. This email did not state that the main cause of my stress was bullying as discussed with me at the meeting, but said that it was because I had been passed over for promotion, which is something I never said. Neil Gordon had on 31 October 2006 communicated to Maggie Burton in an email that he needed to conduct the disciplinary hearing as soon as possible and that in his opinion, I was able to attend the hearing. I believe that this may have influenced the outcome of the meeting with Maggie Burton. Whilst I was off ill and getting more stressed by the situation and was depressed, I sent two emails on 13 October 2007. These again made criticisms that I felt were justified. This resulted in the disciplinary action against me being raised from Level 3 to Level 4 (gross misconduct) and a new hearing was scheduled for 01 December 2006. On 24 November 2006 the Occupational Health Advisor, Maggie Burton, advised the Personnel Manager, Neil Gordon that I was unfit to attend the disciplinary meeting and on 27 November 2006 the hearing was postponed due to my ill health. On 16 January 2007 my GP, wrote to the University confirming my ill health, its causes within harassment at work and my lack of fitness to participate in a disciplinary hearing. On 16 December 2006 and 13 and 27 February 2007 I cancelled my appointments with the University Occupational Health Physician because of my ill health. A further appointment was scheduled for 18 March 2007, but as this was a Sunday the appointment did not exist. In February 2007 my IT account was suspended, along with all my employee services, such as library services and email, without any prior notification. This makes me believe that the University had already decided to dismiss me. On 18 April 2007, I was very ill at home with depression. During the day, whilst I was sleeping, a Royal Mail Special Delivery card was delivered. I didn’t know who had sent it but felt too ill to go and collect the item or cope with any correspondence at the time. On 24 April 2007 I was still very ill at home with depression. I awoke that day and was able to go downstairs to stay on the sofa in the lounge. I slept on and off most of the day and was awakened by a loud banging on the window. I ignored this at first out of disorientation upon waking, but as it continued and got louder I said to a man outside the window that I couldn’t get to the door. The banging stopped and I assumed the man had left. Some time later, my partner came in and told me that another card had been left by the Royal Mail. Again I had no idea who had sent it. I told her I wasn’t able to deal with it at that time, as I was feeling too ill. I believe that during April 2007 I was so ill that I could not visit my GP and he had to come out to my home to see me. On 03 May 2007 I received a letter from the University incorrectly dated 01 April 2007, which enclosed notes of a disciplinary hearing, which had taken place on 23 April 2007 in my absence. The note indicated that I had been dismissed for Gross Misconduct because the University no longer had trust and confidence in me as an employee. I did not receive any reasons for my dismissal and was not given the opportunity to appeal. I believe that my dismissal was planned. The notes do not show that any evidence is considered or discussed in a balanced way in reaching the decision to dismiss me. The University were fully aware that I had not received notification of the hearing and that I did not know that the disciplinary hearing was taking place. There was no attempt to contact me by phone or email prior to the hearing, although this has happened at the previous proceedings. In addition, the University were fully aware that I was not fit to attend a disciplinary hearing. Evidence of my ill health was provided throughout the time. No mention is made in the hearing notes of the fact that I was ill at the time. There appears to be no investigation into the allegations and the Dean, who presented the case for dismissal, was directly involved in the matters concerning the disciplinary allegation against me. It seems that no witnesses were called and a lot of very significant evidence is withheld from the proceedings including various emails. None of the evidence presented is cross-referred or questioned. If I had been given an opportunity to defend myself against the allegations I believe that I would not have been dismissed. The University did not take the background to my dismissal or any surrounding events into account when deciding to dismiss me. They also failed to take into account any mitigating factors. There are a number of false statements made at the disciplinary hearing. For example, I have never been or been proposed to be a line manager and I believe that this would be impossible under my Terms of Contract. Secondly, there have never been any issues surrounding expenses for “home visits” as I did not carry out home visits. Thirdly, it is not true that I made weekly allegations of bullying. Fourthly, I did present information and evidence to the Stress Review but the investigator refused to investigate the allegations beyond one event. The “Talking is not working” document is not a web-log, but a message posted for private on-line discussion forum which requires registration to view and post about bullying in academia. It is not clear how this document was obtained by the Dean. I was at the time studying for an MBA in Education at Keele University and doing research into bullying and harassment in post-92 Higher Education Institutions. When interested in the problem because of carrying out research, it is important to validate research by evidence. I was also outraged by the behaviour of the Management at the University. All my actions were to protect my rights or the rights of other employees or my students. I tried to do the best for my colleagues and my students. I always acted to preserve my job and position. I believe that the University targeted me because I could not tolerate continuous mismanagement and lack of care towards me as an employee. I was always persuaded not to make my grievances formal and when I complained the facts were twisted so that I was blamed for the incident. I strongly believe that I have a right to criticise the University, my employer at an academic level, but have lost my job for doing this. I am proud about being critical and carry out critical studies as major aspect of my research. I never meant to be offensive, personal or attack anyone in a personal sphere. I always made criticisms in an academic way. I believe that it is normal for academics to be critical to preserve academics freedom as enshrined in the Education Reform Act (1988). I also believe the Dean, Robert Moreton, took a disliking to me and was instrumental in my dismissal. I was pushed into sending the emails because of the situation I had been placed in by the University. My actions were reasonable if put into the context of what had been going on. However the University were not interested in my defence and mitigation to the allegations against me as they wanted to dismiss me. I was frustrated by what I saw as serious mismanagement and told them so. I was frozen out of the department by a failure to allow me to develop my role and to participate in curriculum development and finally dismissed for no valid reason. PS: Somebody wrote: "Those who can do, those who can't, bully". Employability, as the main outcome sought from HE in Europe under the Bologna Declaration, also drives its two objectives to create a standard system based on a set number of undergraduate and postgraduate cycles and of a prescribed minimum length and to incorporate a system of credits. It is suggested that the purpose of such objectives is to promote student mobility, making it easier for students graduating in one country to have their achievements recognised equally elsewhere in Europe. While there is some benefit evident in helping graduates move easily throughout Europe on an equal basis, the reality is that the Declaration does not attempt to create a truly equal basis. For example, as the requirement is for degrees lasting a minimum of three years, students studying within national systems which adopt the shortest timescale for degree completion, are automatically put at an advantage as their qualifications are given equal relevance for employment as the longer courses. At the same time the universities in such countries benefit disproportionately in being able to attract more overseas students, not because they provide better education, but because they require less of a time commitment from students. Meanwhile the competition doctrine puts pressures on countries with a traditionally longer degree structure to adapt to the 3-year model to attract students, forcing an hegemony that reduces both student choice and university autonomy to determine the structure of learning. At the same time there is no restriction on universities charging ever increasing fees to students as is the case in Britain. This effectively can mean universities are free to charge a premium for ‘express’ courses to those who can afford to pay. The mechanism of credits pushed by the Bologna Declaration to quantify study, including that not leading to degrees and time spent in the workplace, also erodes the value of certain qualifications. It basically ensures that students are able collate periods of study on a modular basis. This might work well in practical terms for many students, but is more suited to vocationally-oriented learning than social disciplines, as acquired knowledge is awarded on a fragmented and discontinuous basis with a strategic underlying motivation. This is particularly so in the case of credit earned for vocational training where the learning priorities rewarded are essentially those of employers not workers. Credits shift the emphasis onto the quantification of educational achievement as opposed to personal development and appreciation of a field of knowledge. The detriment of such schemes is felt by those students who spend the longest time devoted to study and study the least economically-oriented disciplines as well as the universities which host them. Furthermore, instead of encouraging and enabling citizens to devote part of their lives to learning as an open, critical and unfinalised endeavour, under a credit system study becomes accessible for many through or between employment only. The problem lies, for the large part, in the fact that the declaration is purposefully set out to make it easier for qualifications to be standardized as goods of consumption on a minimum basis, instead of making it easier for the working class to take time out from the labour and manage their lives more independently from the needs of the market. This time out would be devoted to learning for the sake of learning; learning for the sake of knowledge, as an intrinsic activity. The declaration is certainly not, for instance, counterbalanced by an undertaking to ensure free access to HE for all, without economic barriers or imposed hegemonies. In this sense, the mobility promised is effectively on the condition of embracing the ideology of the free market, in a way that students see themselves as units of consumption, or as precarious unit of labour. Only those who can afford to stay out of employment for several years can hope to spend time learning for social and cultural reasons primarily – not ordinary workers. The objectives of the Declaration overall seem to falsely represent a sort of safety net promising universal access to education, which will afford graduates social and economic mobility as a result. In reality access to education is becoming more and more expensive and the truth is that the declaration’s objectives aimed at mobility and employability also act as drivers to mask the erosion of the number of opportunities for diverse modes and foci of study. The point of such objectives is not really to increase opportunity to study, but to shift the emphasis in HE towards learning how to be effective in employment and adapting the self to priorities established in the free market, by profiteers of human labour. It works out this way mainly because it is very difficult to trace and maintain a system of quality control in such a marketised system of HE. And if such systems of quality control are in place, surely they control people and not the standard of work; in fact quality, like education itself, is always undefined and as such, not possible to control except if the student is conceptualised in a particular manner. Neoliberalism has found it easy to conceptualised the student in a manner that those employable are the ones who have absorbed the doctrine of meritocracy, competition, performativity, productivity and the will of the free market to determine the human race. The signatories of the Bologna Declaration seem to think that increased mobility of European citizens has to necessarily coincide with less diversity of the opportunities open to them. Instead of identifying and protecting the diversity of European systems to promote knowledge exchange, they aim for standardization. They combine the wilderness of the free market structure with quality control mechanisms. 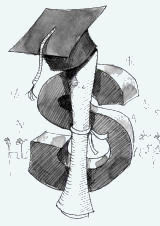 This means universities strategically setting the lowest available standards and functioning as a training service for industry, may be perversely perceived as ‘better’ or ‘more successful’ universities simply because of their skill as capitalist opportunists in exploiting and profiting from the possibilities of a postmodern market system of HE. Similarly, the students who pass through these ‘better’ universities, have their studies valorised above other graduates on no grounds more substantial than it is what the market allows. The Bologna Declaration sustains rhetoric of employability that is central to the redefinition of HE as an economic system. It promotes tools like the Diploma Supplement (a document giving more information about the contents of a qualification earned) aimed at increasing the depth and comparability of degrees across Europe. This is supposed to make the European HE system more internationally competitive. The rhetoric sounds promising, implying that students in Europe will have a better chance of employment and it is underlined by another positive-sounding vocabulary: meritocracy. The reality is not so promising because the mechanisms of the free market are left to determine the structure of the economy, the nature and typology of employment and what constitutes merit-worthy achievement. The result is a technocratic and instrumental conceptualisation of knowledge that is separate from any epistemological basis. As employability takes precedence, degrees are literally manufactured in accordance with sets of product specifications. Both student and employer expectations and responsibilities in relation to such qualifications reinforce an approach to learning as a competitive individualistic activity whereby student peers are potential opponents in the job market. This can both obstruct the disinterested exchange of knowledge and result in a struggle for academics to disseminate ideas which either bear a weak connection to the market or which contradicts its ideology. The situation is complicated further when the HE system allows the market to reward universities which turn out the most employable graduates. In this way, universities gain reputation and market share in much the same way as sausage machines. The neoliberals justify turning education into a knowable ad exchangeable commodity why pretending that it will ensure greater meritocracy. In other words, employability is supposed to be open to everyone, ‘elitist’ practices of restricting admission are abolished and private sector structures, values and processes are put in place, enabling competition to determine educational quality and individual success. There is little role for the interpretation of meritocracy we are usually sold; of having our hard work and integrity recognised and respected. This is because the economic priorities of neoliberal ideology set the meaning of meritocracy so that what really matters in being an employable graduate is how readily and absolutely you have embraced that ideology, not how hard you have studied or what good you have contributed to humanity. In Britain the effects of this are clear as the number of British graduates moving into postgraduate research study . In Britain there is a precarious dependency on overseas students (especially from China) in the postgraduate sector in particular, as home students prefer to move into employment. As tools aimed at forcing a competitive mentality in HE such as league tables, work to place universities in a scale based on criteria that are often alien to the interests of local populations, student graduation and mobility becomes centred on aspects like prestige and ranking rather than qualitative dimensions of knowledge-based institutional communities. Those who graduate from the most prestigious universities will gain access to work more easily than those who attend a ‘local’ university. Universities from the local to the internationally prized will promote themselves competitively to attract students from abroad, draining historically disadvantaged regions of capable citizens. Instead of fostering knowledge and capability in a localised context, so that knowledge becomes more evenly distributed across populations and geographies, students are drawn towards the elite and encouraged to learn for profit. Employability in a mass global education context is about tuning skills and competencies to the demands of a volatile job market. The result is the transformation of many universities into degree mills. They are rewarded financially for supplying usefully qualified graduates and enhancing government statistics on access to education and employability. But the market and employers reap the best benefits, while students (and their parents/families) and expected to foot the bill. After nearly ten yeas, the effects of the Bologna Declaration in shaping European Higher Education (HE) along neo-liberal lines are becoming evident. In so far as the Declaration affects the immeasurable tenets underpinning education at all levels “of knowledge” and personal growth, academic freedom social equality and cultural heritage and development, its effects are essentially disfiguring rather than reformatory or revolutionary in any popularly beneficial way. It uses rhetoric to blur its real focus on economic and neo-liberal ideological foundations of knowledge as opposed to the social and cultural. Most alarmingly the declaration is an attempt at the appropriation and redefinition of education as a marketable and exchangeable commodity and a tool of capitalists. The hidden agenda of the declaration is to create an Higher Education System which enforces hegemony to an Anglo-American style European system of HE based on scientific supremacy and technology. The constituent cultures are implicated in a process of adaptation to the ruling dogma to ensure that they ‘appeal to other nations’ and thus ensure their ‘vitality’ and ‘efficiency’ are sufficiently rated according to criteria imposed by a neoliberal elite caste. It represents a truly colonial mentality towards all aspects of education; a mentality which renders education at the service of the capital colonialists who rely on the same education system to indoctrinate the masses of slaves and ensure their compliance in their own oppression. The Declaration talks of an education system that must be reconfigured to acquire an international attraction equal to that of European and Scientific traditions. In doing so, the role of education at the root of such traditions is displaced. It is effectively reclaimed by the signatories entrusted with its control, as a system to be molded around economic needs and used to reinforce a neo-liberal cultural, economic and political hegemony across Europe. 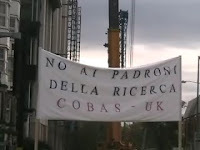 Cobas UK is actively protesting against the proposed reforms of the Berlusconi government in Italy aimed at privatising and cutting public funds to all levels of education, as well as research. The neoliberal agenda to control knowledge for the ultimate benefit of capital which drives such reforms is also reflected in moves by UK institutions and elitist collectives such as the Russel Group. Increased privatisation of universities and research means that fees will likely rise as universities sell education as a product with a quantifiable market value. In an unstable and unjust capitalist economy, students are not guaranteed employment. 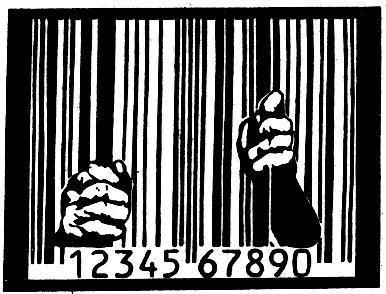 In reality only a few will avoid the oppression of a lifelong struggle to meet the basic costs of living; even those who graduate from the most elite institutions. 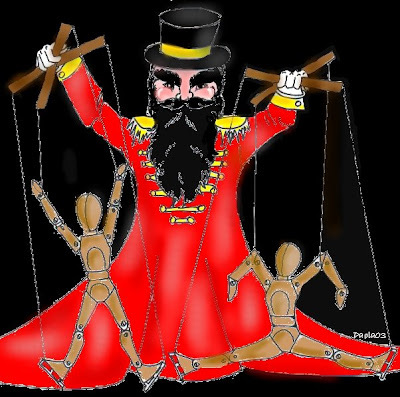 As league tables and ‘Quality’ regimes architected to contrive an auto-referential system of accountability and competitiveness, manipulate ideas of what learning should be about, elite groups of university executives reap the rewards of a privatised HE sector. Not students. Not lecturers or professors. Not researchers. They sell courses as products for profit, increasingly to overseas students, at huge fees. They compete for income from businesses and government. Such competition from privatisation forces universities into practices which go against public and academics’ interests. Only research and courses which can bring financial income are supported. Private organisations should not interfere with the work or lecturers, students, departments and universities in general, whose endeavours to build knowledge for the public and social good, and right to pursue learning for its own sake, must be supported. In a time of financial crisis, it is time to block the advancement of capital within learning institutions and safeguard against the commodification of knowledge. Privatisation and competition can bring only inequality and extortion to Higher Education. Unite lecturers, students, parents, graduates to say no to privatisation. No to the sell-out of education. Today, we have manifested against Berlusconi government for legislation which would like to privatise universities in Italy and restrict access to research only to elite organisations. 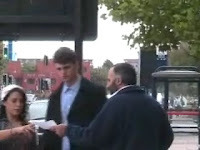 We have distributed some leaflets in front of the Italian consulate in Birmingham to support also the manifestations organized by Rifondazione Comunista that were contemporaneously taking place in London and Rome. We will continue with other days demonstrations around the country in front of Italian consulates and British universities to demonstrate our disapproval for the global policies of universities and research privatisation hidden behind rethoric of "quality", "professionalism", "leadership", "efficiency and profitability" and all the neoliberism parafernalia. 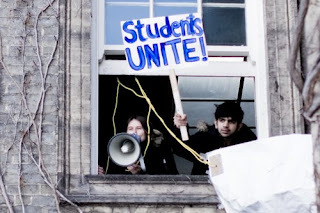 Join us in this struggle by spreading the message and talking to students, parents, politician and all people known to you to say that university schools and research privatisation must be stopped. If not it will centre power in the hands of a few who will inevitably ask for the payment of very high fees and will not give access to research which does not support their speculative interests.